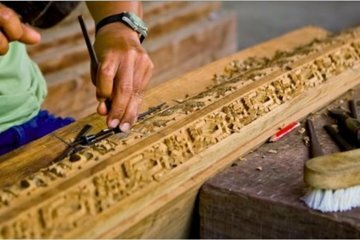 Conozca a los creadores de las artesanías y obras de arte más exquisitas de Tailandia con una excursión de medio día a Sankampaeng, un pueblo famoso por sus productos de laca, teca y platería. Vea cómo los tejedores crean diseños elegantes en seda tailandesa, y vea cómo toman forma los delicados paraguas de papel. Aprenda cómo se hacen las cerámicas de celadón luego, vea talladores de madera que trabajan en muebles elaborados. Conozca a los artesanos que crean algunos de los mejores cubiertos de plata del mundo y explore una notable variedad de obras de arte antes de regresar a Chiang Mai. Tour de medio día a un famoso pueblo de artesanía. Perfecto para compradores y amantes del arte. This was the best tour. We ended up doing all of our souvenir shopping at all the factories and everything we bought was super high quality. Plus, it was great to buy products directly from the people making them, rather than through a chintzy shop. So awesome! Thai workmanship is amazing. The skills and dedication of the artists we meet was worth the visit. You can cater the tour to suit what you want to see, but we highly recommend the wood work/carving and the pottery. Both give you a great appreciation for the amount of time and effort involved in producing the fine products you see. We didn't feel pressured to buy anything, which probably meant we bought more as it was of our own free will without any pushy sales pitch. Great tour and our guide Aim, was very knowledgable.